These are small enough to make fondant letters for cupcakes. They cut perfectly and wash-up great. They come in an organized storage container - no missing letters! These are great to have they come in handy I only wish they could be stainless! Don't leave them sitting in water too long cause they will tarnish. I love these! They cut without any difficulty. I have used mine so much they are starting to get bent so going to buy another set. They are the perfect size. These alphabet cookie cutters are a good size, and come in a convenient storage tray. My son even likes to use them for his play dough. 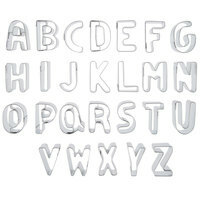 We use this alphabet set to cut out fondant letters for the tops of our cupcakes. They are the perfect size to cut one letter per cupcake and spell out a message to the happy recipient. Excellent sturdy cutters made of tin and the perfect size for cutting fondant letters for small cakes and cupcakes as well as cookie dough. The storage tin is a big plus. I really love the new Ateco 1" alphabet cutter set. It makes writing on cakes a breeze! You can create so many different colors or stagger the letters to give cakes a special effect. These work very well with fondant, but can be a bit wiggly. Other than that, they work very well and have a nice fun font. Very nice alphabet cutter set. They are the perfect size for cutting letters out for cakes and cookies. The fact that they all fit in a small case makes them perfect. This is a nice set of cutters. They cut well, and the shapes of the letters are normal. They are very small. I tend to forget how small an inch really is. I received my ateco alphabet cutter set and tried to use it to cut fondant and it was not as easy as i assumed it to be. I will practice more. The letters aren't exactly appealing. They look childish and don't have any elegance to the font. Not too happy with this and don't really ever use them. We appreciate your review, Mitzmichael! If you are looking for a different product that will better suit your needs, please contact our Customer Solutions team. When I bought this I was not expecting to be using it all that much but surprisingly, it comes in handy quite often. We used this to help our kids learn to spell and since they get to eat the word after they make it, they love it! Highly recommend! We like to do something fun for our customers on their birthdays. So we use these to put their name or happy birthday on their plate. Add a candle and you have a happy customer with a smile on their face! These have lasted great!! Very cute cookie cutters. Kids and moms alike will love them. You can even use them at home to practice the alphabet with a young child in a fun way. We have been able to do the cutest things with this set. We have spelled out names for parties and activities at school. The letters are a great size. Good item to invest on, especially my hobby of baking. I love how the product is priced very well. Not so expensive. Thank you for the great service. Excellent cutters! Sharp edges produce clean cuts each and every time!! High quality and built to last! Worth the investment!! Great for cookies and cakes! Fantastic for birthday treats!! I love these cutters, they work well with chocolate and fondant for lettering on cakes and cupcakes...they are big enough that the fondant doesn't stretch when you poke it out, and it doesn't stick to the letters either. Also, they are sturdy, so when I accidentally dropped one it did not lose its form or change its shape...good stuff! This is a well priced product, that is packed nicely, easy to clean and store, this product exceeded my expectations and is a great performer.